The Nepal Army got a new acting Commander in Chief on Thursday and, with him, a real hope that the military will finally get a much-needed rebranding. While public opinion polls show that the Army has consistently been the most trusted institution in the country, its image has been tarnished of late because of involvement in construction contracts that should be the job of civilians. 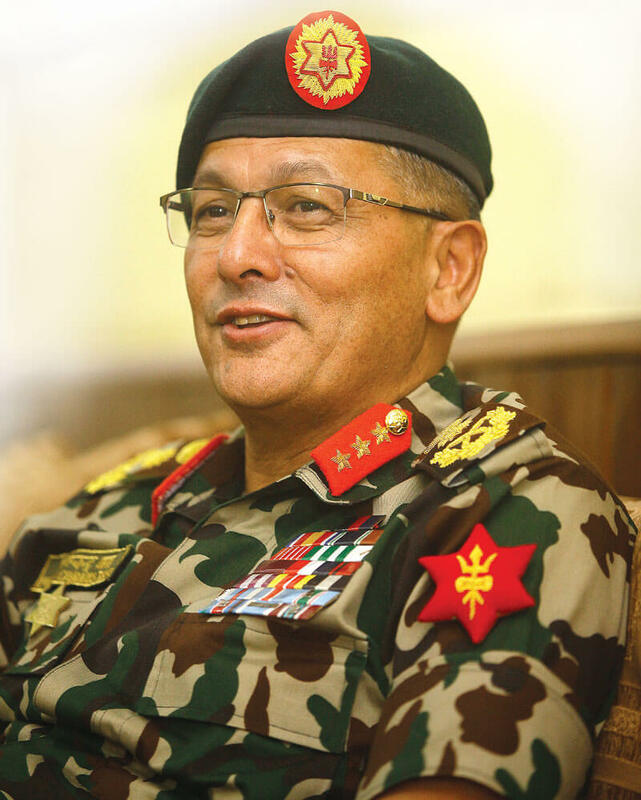 Whether Lt Gen Purna Chandra Thapa (pictured) will be able to rebrand the army as a professional national security agency rather than a commercial company will define his success, and ultimate legacy. After the Maoist war, the Army’s image was tarnished by accusations that it is more interested in bagging government contracts than defending the country. For its part, generals say privately that the government hands over projects, like the Tarai Fast Track or Ranipokhari reconstruction, when they get to be political hot potatoes. Lt Gen Thapa is said to be disenamoured with the military getting into business, and is expected to revert the Army back to its professional role of gathering intelligence, defending the country and its nature reserves, and saving people from natural disasters. Thapa was not pleased with the way the Army Officers Club at its HQ in Kathmandu had been turned into a public banquet hall for weddings. Thapa lobbied strongly to allow only officers to rent it. Thapa is also expected to review the Army’s decision to rent out the new nine-storey building that replaced the earthquake-damaged Tri Chandra Military Hospital to a commercial company. The hospital was built by Britain in 1925 in memory of the 20,000 Nepalis who were killed in Europe in World War I. The Army brought down the 85-year-old neo-classical structure, saying it would build a new hospital there, but instead rented it out as a shopping complex. During the insurgency, when civilian contractors were not able to operate in the war zone, the Army began to build roads. But this practice continued in peace-time. The Army has been running gas stations, is involved in housing under the pretext of building ‘veteran homes’, and had been lobbying to develop hydropower projects. Politicians have goaded the generals to be involved since anti-corruption agencies cannot investigate the military. The Office of the Auditor General regularly puts up red flags about Army projects, but these are never followed up. Lt Gen Thapa will receive his badge from President Bidya Devi Bhandari next month, and has his work cut out: sidelining vested interest groups in government, arms merchants and generals, who have together discredited the Nepal Army.